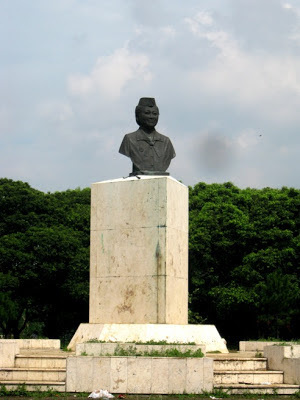 The half-bodied statue of Mrs. Tien Soeharto -a first lady of a former Indonesian President Soeharto- wearing an uniform scout. The statue located at a field inside the Scout Campgrounds Cibubur (West Java, Indonesia). Captured from a moving car; I wasn’t able to take shots from better angles. i think this would be the first one i'd be hearing of a statue of a first lady. good job indonesia. 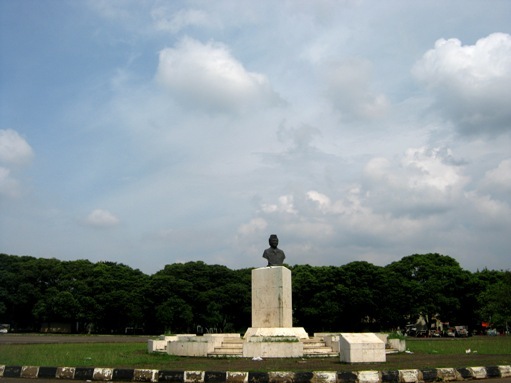 A lovely statue against a wide, blue sky. Great image. How nice to see a statue of a woman! Lovely pic. Nicely taken,a great way to remember the former first lady. Lovely statue and a pretty view of the sky. Great shot! Happy Skywatching! Great captures from your moving car ... I love the big wide blue sky.